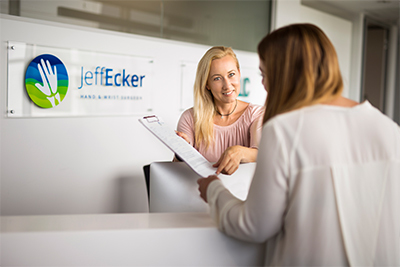 Mr Jeff Ecker has hand-selected our exceptional team who assist him to provide the best possible patient experience and outcomes. Our highly qualified and friendly practice consists of a registered nurse, paramedic, biomedical scientist, health scientist, statistician, organisational psychology consultant, nail technician, lawyer, accountant, IT specialist, and occupational hand and upper limb therapists. We pride ourselves on being known as one of the country’s best medical facilities. Mr Crepaldi is an Orthopaedic Surgeon who completed his training in Brazil and then spent 6 years in private Orthopaedic Hand Surgery practice in Sao Paulo. ln 2018 Mr Crepaldi completed a 12-month Fellowship in hand and wrist surgery at the St. Vincent's Hand Centre in Melbourne. In January 2019 Mr Crepaldi commenced a 6-month Fellowship at Jeff Ecker Clinic. ln this clinic he regularly examines patients and assists in operations on the hand, wrist and forearm under Mr Ecker’s supervision. Mr Crepaldi also assists in operations performed in Bethesda Hospital, St John of God Hospital Subiaco, Hollywood and St John of God Hospital Murdoch. Helen has an Advanced Diploma of Accounting and trained under a chartered accountant for 8 years. With 17 years bookkeeping experience, Helen is currently studying towards a Bachelor of Commerce (majoring in accounting) at Curtin University, and heads our Finance Department. Helen assists patients with any account queries they may have, and is passionate about ensuring that all financial aspects of the clinic run smoothly and efficiently. Courtney has a Bachelor of Biomedical Science (majoring in Paramedical Practice) from Edith Cowan University, and a Master of Arts (specialising in Human Rights and International Law) from Deakin University. Courtney is highly skilled in the sophisticated technique of audio-visual editing for clinical education and research. She works closely with Jeff to assist in the preparation of his presentations for national and international scientific meetings. Julie graduated from Murdoch University in 2014 with a Masters Degree in Organisational Psychology and a Graduate Certificate in Counselling. She is an experienced Wellbeing Coach and Workplace Injury Management Consultant. Julie is responsible for overseeing the Medico-Legal Department, patient bookings and enquiries, and co-ordinating clinic administration. She is dedicated to providing an excellent service for our patients. Catherine is an experienced Nail Technician with a background in equine dentistry, cafe management, and events, as well as many years of administration and secretarial experience in various hospitals and clinics in the United Kingdom. Catherine has a warm personality and a great ability to interact with patients in a friendly and compassionate manner. An ever-friendly face at our reception desk, her extensive experience ensures our patients always feel welcome. Karolina has acquired a Bachelor of Science (majoring in Psychology) from the University of Western Australia in 2011, before completing a Bachelor of Biomedical Science with First-Class Honours from the University of Notre Dame in 2014. Karolina is passionate about clinical based medical research and is involved in many projects within the Research Department in our clinic. Karolina works with our team whilst studying a Doctor of Medicine at the University of Notre Dame. Katrina is Personal Assistant to Mr Jeff Ecker and Sophie Costanzo. Katrina studied interior design at Edith Cowan University and then progressed into the medical field where she has worked for over 10 years. She has been a Medical Secretary and Personal Assistant working for doctors in the fields of allergy, respiratory, neurosurgery and orthopaedics.